If you were to take Jakob Ullmann’s solo III for organ, Stefan Fraunberger’s Quellgeister series and Monty Adkins’ recent Shadows and Reflections and use them as the basis for a new composition, the result would probably closely resemble one of the most (if not the most) stunning releases i’ve heard so far this year: The Slow Creep of Convenience by Anthony Pateras and Erkki Veltheim. Ullmann, Fraunberger and Adkins all utilise the organ as the basis for their long-form, slowly-evolving soundworlds, and while The Slow Creep of Convenience adds Veltheim’s electric violin to Pateras’ pipe organ, the two are so seamlessly blended that for much of its 50-minute duration it’s easy to hear the violin as an integral timbral extension of the organ. 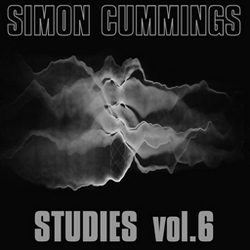 However, the main reason i cited those three works, aside from instrumental and durational considerations, is because of the way The Slow Creep of Convenience combines Ullmann’s determined patience, moving according to its own internal logic rather than external expectations or conventions of musical narrative, Fraunberger’s improvisatory unpredictability, responding to the sounds themselves rather than to a pre-planned scheme, and Adkins’ harmonic complexity, establishing a soundworld that at once both alludes to and undermines varying notions of tonality, remaining ever in flux. EV: I think it’s a way to move from treating sound as representation towards exploring sound as phenomenon. […] Playing long, slowly evolving pieces also gets away from easily recognisable formal devices, relying more on a highly attuned perception of the acoustic activity in a given space than on recognisable thematic materials. Veltheim goes on to describe The Slow Creep of Convenience as having a ‘formlessness’ in which “each listening can result in very different experiences of the music”. That’s true of all music, of course, but it’s especially important and relevant in this piece as the move away from more obvious manifestations of formal structure could result in a work that’s entirely superficial, articulated solely by what’s going on on its surface, lacking long-term depth or sense. But that isn’t the case here, for various reasons, primarily the very specific palette and behavioural language which act to unify the piece as well as make (possibly spurious) connections over a long period of time. Although Stravinsky’s famous remark about the organ – “the monster never breathes” – is mistaken (the problem surely lies more with organists than with the capabilities of the instrument), if we play with the idea that it’s actually correct, this can nonetheless be a virtue as much as a vice. From one perspective, The Slow Creep of Convenience is like a single, impossibly enormous exhalation, in which expelled particles of air and water vapour are magnified and transfigured into long streaks of pitch. Of central importance throughout is an interplay between consonance and dissonance. In many respects, the soft opening chord says something important about everything that’s to follow: G-A♭-C, an overlaid major third and perfect fourth, the semitone clash gently buzzing against the otherwise calm clarity of the chord. This typifies the harmonic subtlety of the piece as a whole, in which dissonances are often placed such that their presence is hard to detect, lending the strange impression of a lack of activity while at the same time sounding as though movement is positively teeming in every single passing fraction of time. But by no means is it always like this; from its simple starting point, The Slow Creep of Convenience undergoes the most extensive development, where chords are complicated or clarified by gradual addition or subtraction of pitches, imperceptibly moving between being clustered and spare. Even in louder episodes, the subtle way these shifts are enacted has the effect of somehow reducing how dissonant some of these clusters sound. Not, it should be stressed, because this is in any way ‘ambient’ music – only a fool would think its long-term, measured pace in any way equated to periods of ‘ignorable’ music – but due to the way, over time, it makes increasingly unclear precisely what ‘consonant’ and ‘dissonant’ mean in this context. There’s a parallel interplay between high, medium and low registers. The organ pedals are used sparingly, causing them to have an enhanced dramatic effect. Pateras primarily employs them to lay down drone-like fundamentals that both resolve and confuse different situations or, more exciting, as juddering clusters of bass that threaten to break everything apart. (Spoiler alert: the first such occasion is just before 30 minutes in and is an unforgettable, WTF moment.) But the majority of The Slow Creep of Convenience is situated in higher registers than this, undertaking an epic journey through a myriad connotations of tonality. Dense agglomerations difficult to parse suddenly make a new kind of harmonic sense simply through the addition of a single note somewhere further away; compressed clusters lose all pitch focus and resemble shimmering shafts of bright light or convoluted ripples on the surface of water; and on several occasions chords find themselves sounding like strange dominant chords searching in vain for a tonic. Overall, these twin interplays are merely part of an even more fundamental one between action and rest. It’s fascinating how some of the most theoretically dissonant passages in the work nonetheless take on a kind of immobile elation, while many of its more ostensibly straightforward sections display an incredible sense of pent-up tension, seemingly full of potential energy just waiting to be unleashed. This is another consequence of the way that The Slow Creep of Convenience ignores and then rewrites our definitions and expectations. As such, i don’t believe it’s a work that’s designed to be heard in relation to one’s preconceptions, but in spite of them. So while there’s a temptation, for example, to hear later instances of chords that resemble the opening one – at 36 minutes, now inverted, and at 43 minutes, now containing an augmented fourth – as brief moments that make gentle unifying connections, the more i’ve listened to the piece, the more i feel this to be illusory. i suspect it’s me hearing what i want to hear, rather than hearing it on its own terms. It’s magical when a piece so gently but firmly insists itself in a way that, without you at first even realising, starts to pick apart both the way music supposedly ‘works’ and, concomitantly, the way we engage with it. It revivifies everything, both music itself and us as listeners. 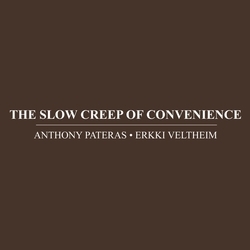 And quite apart from all that, bearing in mind Erkki Veltheim’s words, as an exploration of sound as a phenomenon, The Slow Creep of Convenience is breathtaking. It may even be a masterpiece, but perhaps that’s too conventional a concept to apply to it; either way, it’s an absolute marvel to behold. The beautifully presented CD edition of The Slow Creep of Convenience is limited to 300 copies, some of which can still be had via Rumpsti Pumsti, Metamkine (both Europe), Squidco (US), Radio Free Alice (Australia) and Omega Point (Japan). 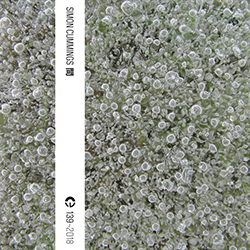 Alternatively, a digital download – which sadly doesn’t include the booklet – is available via Bandcamp, from Anthony Pateras’ Immediata label.